It was simply gorgeous this weekend! I love the warm weather, it was actually so warm I was sweating! On Sunday I finished pulling my weeds in my vegetable garden and pulled out my mint, which was taking over. Don’t plant mint in a garden, it really spreads. I know I’ll be pulling mint out probably for the next couple of years! My strawberry plants have some berries on them and I saw quite a few lady bugs and worms. Yah! Last year was my very first vegetable garden so this is year two. My soil was pure sand, so I really gave it some love last year and my garden did wonderful!! All that work paid off because my soil is now perfect. So all I have to do is add some new compost and I’m ready for spring planting. I also did what I would say yesterday, I woke up and did 40 minutes of strength training, so glad that I did that. I feel great! I also walked to Starbucks instead of driving there, that’s only a mile round trip. I saved gas and I got some exercise, not to mention had a Trenta ice coffee, with sugar-free vanilla and sugar-free caramel with non-fat milk. I always ask to put in a shot of milk, so my drink is about 20 calories. Can’t beat that!! Now that it’s Sunday night, my legs are a little sore. I think it was all the squatting I did in the yard. No pain, no gain. I’m really trying to be better on exercise and eating!! On Friday night I made Taco Wontons for dinner. 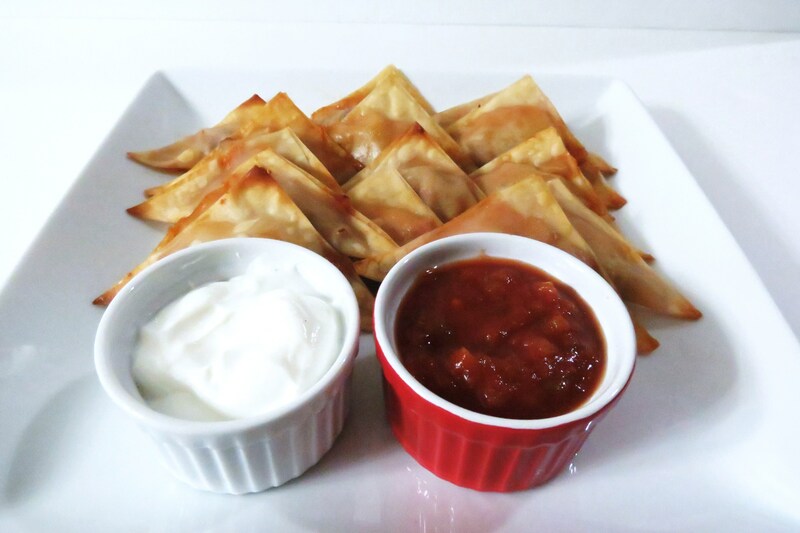 This is such an easy and great appetizer. I made tacos, and had leftover meat, so I thought why not. So glad I did! I made 15 Taco Wontons and I ate 4 of them and my husband ate the rest. He said he loved them. He must have, he gobbled them right up! I really love working with wonton wrappers. I get on these kicks on certain products and I can’t stop. I already have some other ideas that I’m cooking up. You can stuff these bad boys with anything! All I did was add 1 teaspoon of ground beef, 1 teaspoon of salsa and a sprinkle of cheese. Then seal up and bake for 15 minutes and serve with greek yogurt and salsa for dipping. Perfecto! It doesn’t sound like much ingredients, but it’s enough. I over did the cheese on a couple and they oozed with cheese, so a sprinkle is perfect. Place 1 tsp. of ground beef into wrapper and top with 1 tsp. salsa and a pinch of cheese, take your finger and dip in water and place along the edges of the wrapper (this will be the glue to seal the wrappers together). 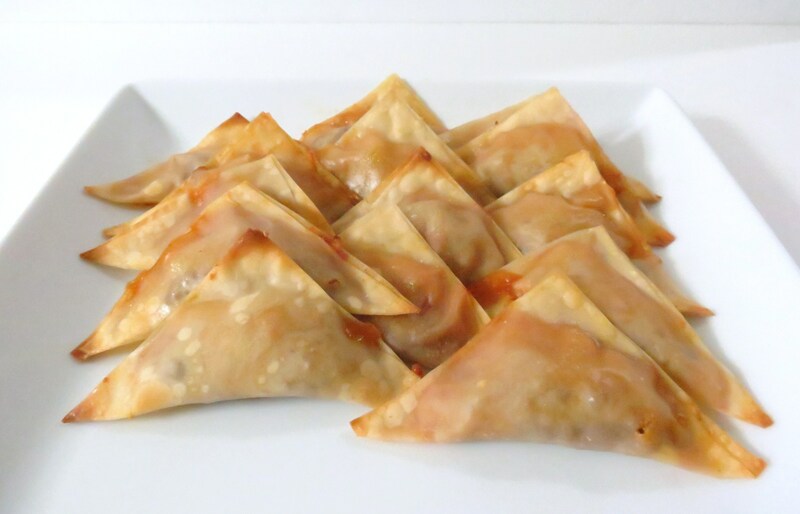 Fold wrapper over into triangle place on baking sheet. Do the same for the rest of the wrappers. Spray each wonton with about two sprays of butter. Bake in over for 15 minutes, until lightly brown. 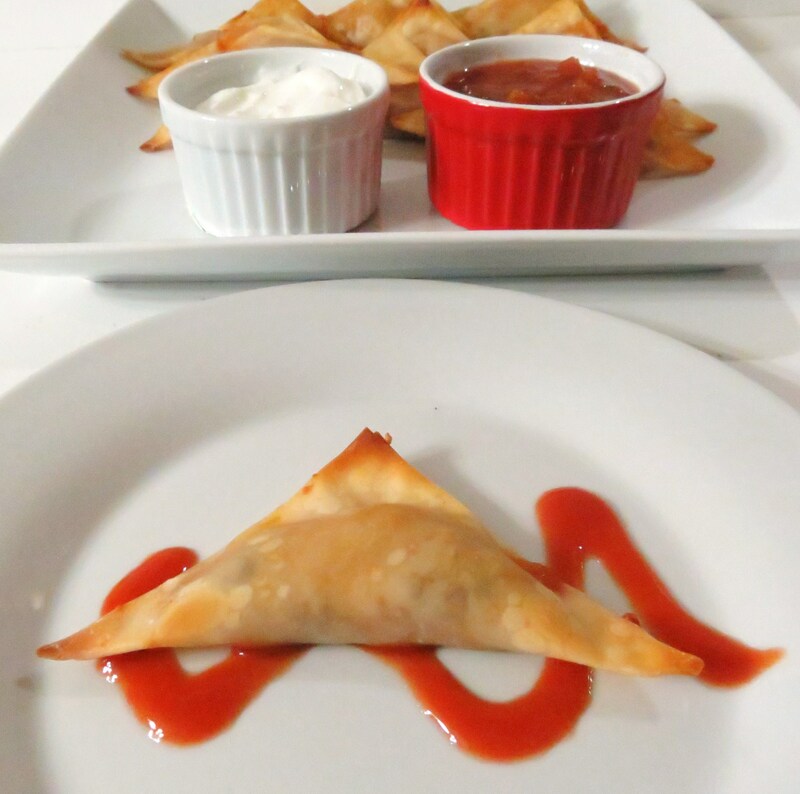 If you’re looking for an appetizer for a party or a quick meal, you must make these. You will not be disappointed! I’m wondering if I could make a batch and freeze them before cooking them? I bet it would work? I freeze my wonton wrappers and they are fine. This would be wonderful for fend for yourself night. I want to congratulate Erin from Spiffy Cookie for winning the Peanut Butter Lovers Gift Pack. I also want to thank everyone for entering. I had fun with this, and I plan on doing another giveaway soon. I just need to think of something creative. Oh and I am going to make some cookies, that someone posted. Once I make them, I’ll post them. There are so many great recipes, and if you have a Peanut Butter recipe you want to share, the link is still open, so please add it. You can never have enough peanut butter. Also, not putting pressure on you, but as some of you know, Peanut Butter and Peppers was nominated by Fitness Magazine for Best Healthy Eating Blog. I would love it, if you would vote for me. So far I only have 16 votes. 🙁 If you want to vote, please go here. awesome ! you are up to 18 votes now! Yah, thank you!!! I appreciate it so much, more than you know!! It’s taken me a while but I’m really starting to love strength training…and even, sigh, squats. 😛 GO YOU for walking to Starbucks! That’s the kind of active living that I love. I actually like strength training so much better than cardio, I feel stronger, but I know cardio burns more fat! But I must do it equally, I shouldn’t favor one over the other. congrats on the nomination…im definitely voting for you!! 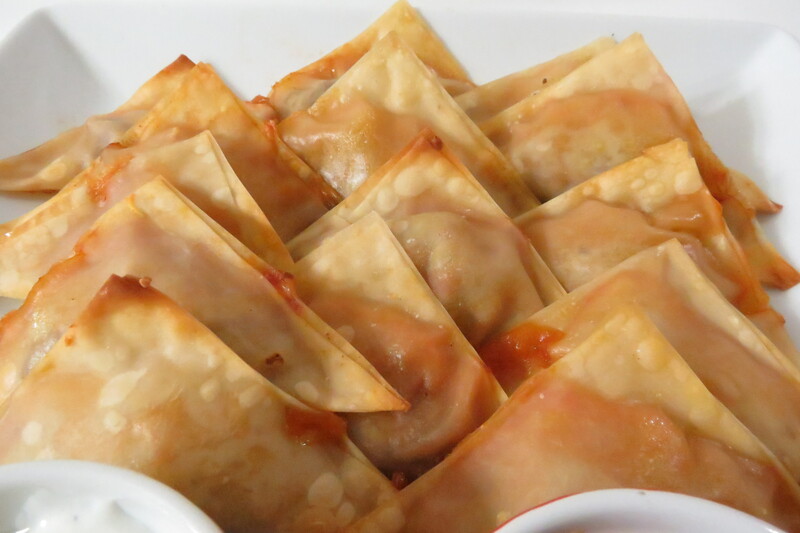 those wontons look amazing btw…great pics! Thank you for your vote!! And thank you for the compliment on the photo’s. I’m really trying to take better pictures. 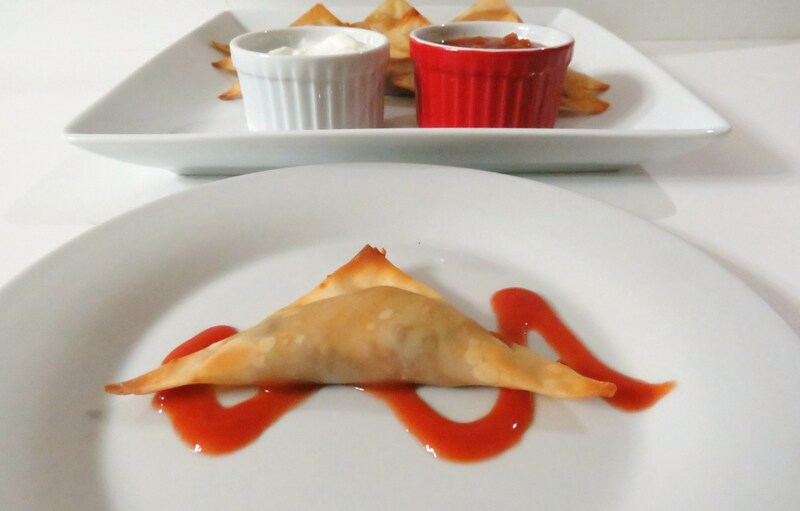 How fun are these little taco wontons! I love using wonton wrappers for so many different things! Going to vote for you now! Thanks Erin for your vote! 🙂 I know don’t you love wonton wrappers. I think I could almost wrap anything. I got other ideas cooking up in my head on what else I could stuff in them. Oh, what a delicious appetizer…I know I’d over load the cheese, too 🙂 And congrats on your nomination….you have my vote! You’ve got my vote! 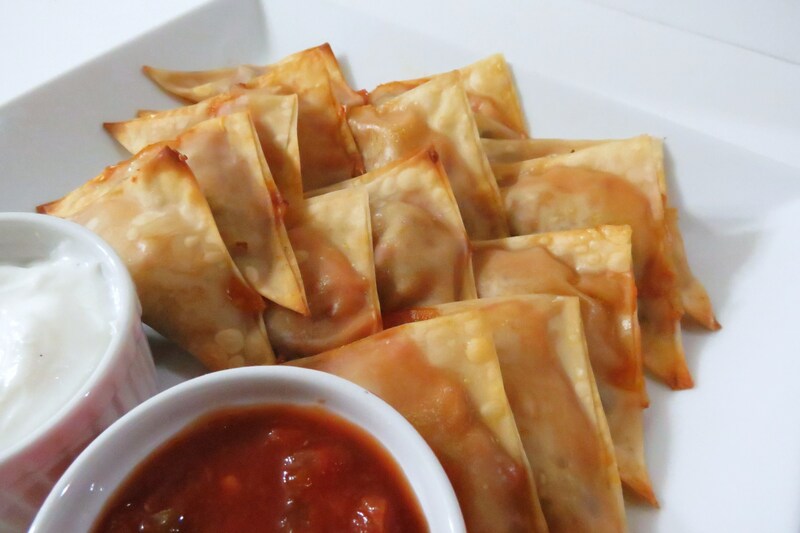 And these taco wontons are genius!!! Love, love, love them! Jennifer – these look wonderful, what a great, creative snack. I think I might have eaten 15 and left 4 for my poor husband! I voted for you! Congratulations – this is an honor! Not too long ago I had something similar at a Chinese restaurant and I fell in love. These look terrific and a whole lot healthier! What a great idea! I need to try this. Thanks for sharing. Oh my these look delicious and I love that they are low cal as well. My family loves dipping anything so I know these would be a hit with us. Can’t wait to try them. Also thanks for linking up to Newlyweds recipe linky, and don’t forget to link back so others can join in. All of these recipes look yummy.These intrigued me because my 8 year old may like them! 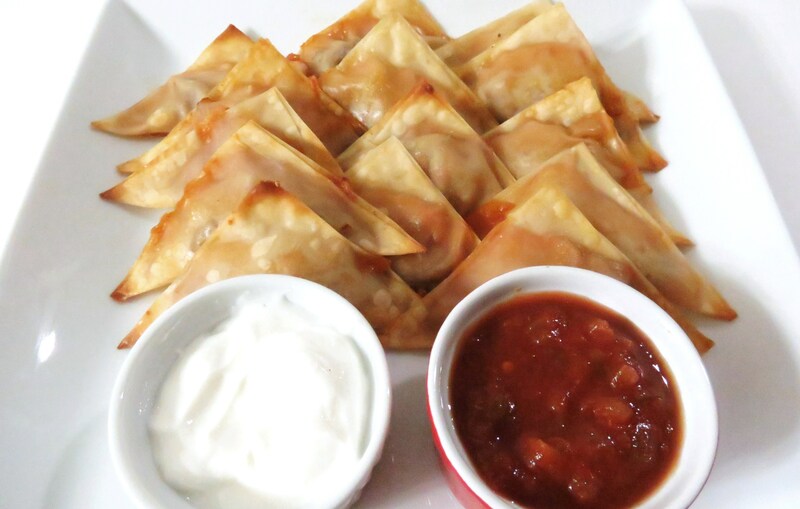 I bet you could also make them with pizza ingredients and have a mini pizza appetizer as well.Have you tried it? Love you site!!! !